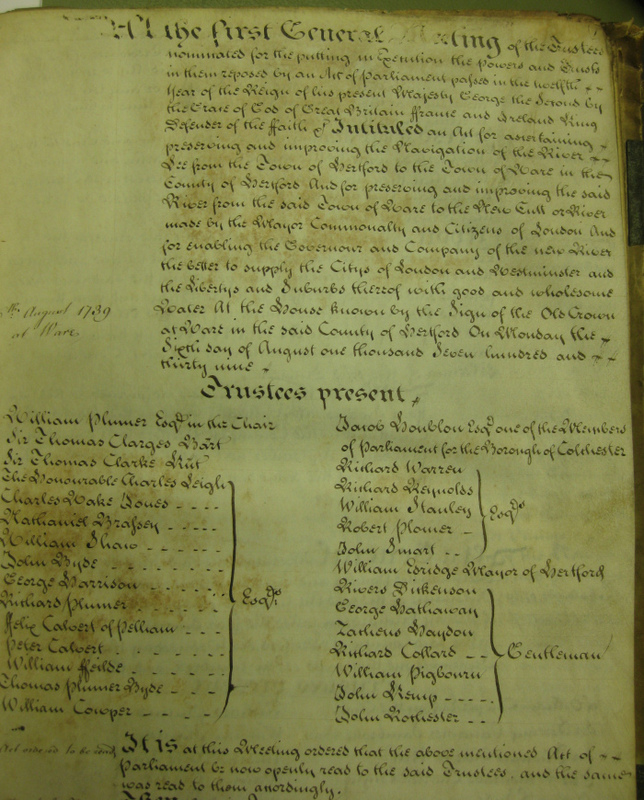 The spelling of Lea/Lee is generally now regarded as interchangeable, as indeed it has been since the names were first recorded. Some of the other variants have fallen by the wayside, although they still survive in place names such as Leyton and Leytonstone and Lu(y)ton. Minutes of general interest. What follows is a distillation of minutes which caught my eye. None of them refer specifically to any particular lock but they all contribute to the overall picture. Some are sad, some amusing in today's world (but nonetheless serious when they were written), some are of historical interest and some are there simply because they appealed to me. 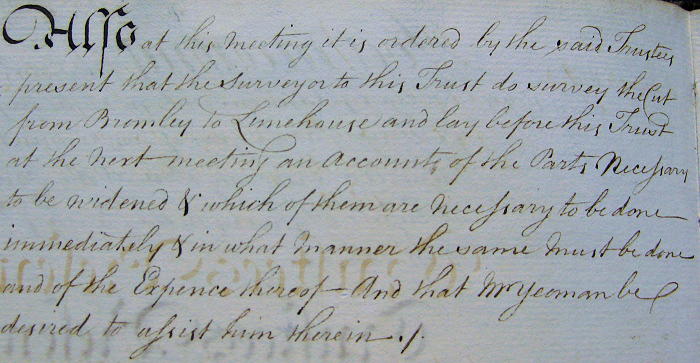 It seems that, despite the fact that Yeoman was recorded as the Surveyor in 1770, this instruction was still addressed to John Smeaton (see the Lee Engineers page). 18.6.1844 "Resolved unanimously (32 Trustees being present) That Mr Francis Giles be appointed to make a General Survey of the River Lee from Hertford to London including Bow Creek and Limehouse Cut with Plans and Sections of the same and to furnish these Documents to the Trustees with all possible Dispatch" (NA Rail 845/10) - see below 23.10.1849. 16.4.1850 "Charles Phelips Esquire (a Trustee) having stated certain circumstances connected with a charge of Felony made against John Hawkins a lockman in the employ of the Trustees which had come under his cognisance as a Magistrate Resolved that Hawkins be suspended from Saturday next till the nest meeting of the Trustees. (Hawkins was discharged on 18.6.1850.) (NA Rail 845/13). 21.12.1861 Contract placed for a steam barge. 18.11.1865 "An application from Carlo Gatti* of New Wharf Road Caledonian Road King's Cross, for the occupation of Land between Homerton and Hackney Wick Bridges for an Ice Store, with the right of taking Ice from the River, was refused" (NA Rail 845/16). 26.5.1871 "Lock keepers - There are two vacancies to fill up.....I would recommend that where an increase of Wages will be the result that Lock keepers at other stations or Labourers...should have the privilege of applying for the situations they have a claim in preference to strangers. 19.5.1882 “That the lock keepers have notice that they will not be allowed to take charge of boats without the consent of the Board. 28.12.1883 The Engineer having reported that a good many of the Lock keepers had of late been passing Barges without signing the Permit and that he had cautioned them several of them; and that the other day a Barge had travelled from Enfield Lock to Limehouse and had passed through the intermediate locks without any Permit. A problem which arose in 1893 concerned the various Ordnance Survey Bench Marks near Bow. Mr Child wrote "...we were at last compelled to conclude that either the important Bench Mark on Bow Bridge was 3/10ths of a foot too low or that all the other marks were the same amount too high". The situation was confirmed and solved in a letter from the Director General of the Ordnance Survey which stated "The revised altitude of this mark (on Bow Bridge) is 23.768 which shows that there has been a subsidence of .295 feet at this point". (NA Rail 845/27). This means that Bow Bridge had subsided 3 and 5/16ths inches since the previous survey about 25 years earlier. 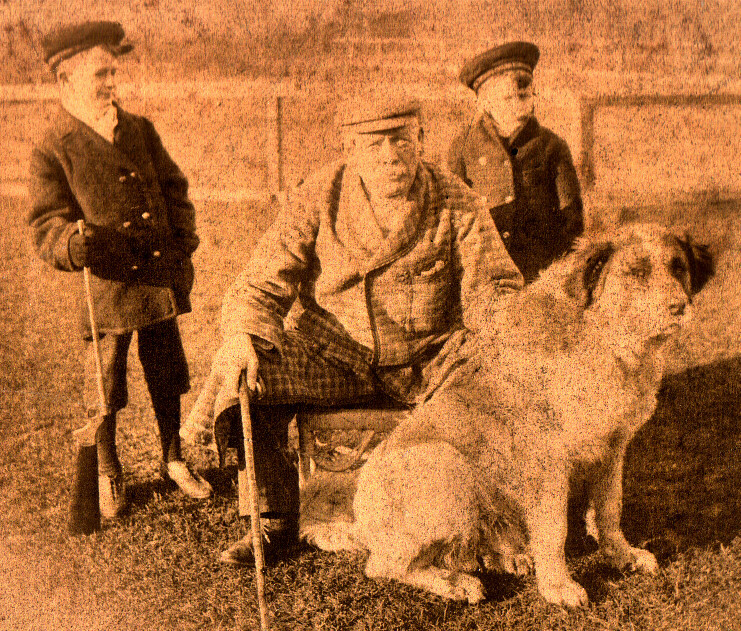 Joe Child, c.1896, his St Bernard and possibly two of his grand-children, Kenneth & Trevor Caldicott. 5.2.1897 The claim from G Wells for damage sustained by his horse stepping in a hole in the towpath above Waltham Common Lock - it was caused by the cover of a wooden trunk or culvert giving way being rotten - which could not be seen until it failed - the horse was examined at Enfield Lock and did not seem much the worse and I think the damage claimed is very excessive (£14.2.0) - a smaller sum might be offered him which I think would be accepted. 31.8.1906 “The Engineer reported that Mr George Corble, who had been Clerk to the Board for the last 36 years, died at his residence, Bridge House, Waltham Cross, on the 24th August, very suddenly” (NA Rail 845/32) In September 1906, the accountants to the Board reported that Mr Corble’s total defalcations of the Board’s funds amounted to £9519.15.10. (NA Rail 845/33) This is equal to £759,000 in 2009. 21.1.1925. The new motor barge of 13’ 3” beam will soon be launched at Millwall and named “The Musgrave” (NA Rail 845/110).